Add granola to food processor; pulse until coarsely ground. Transfer to bowl; set aside. Add dates to food processor; purée until only small bits remain. Add ground granola, cocoa powder and coconut oil; pulse until combined. Return to bowl; stir in coconut. Scoop mixture into 2 tablespoonful portions. Roll into balls. Transfer to parchment paper–lined tray; refrigerate for 30 minutes or until firm. 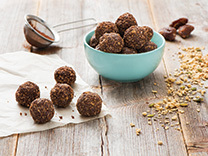 Try making your own snacks like these easy five-ingredient Chocolate Energy Bites, naturally sweetened with whole dried dates and crunchy coconut granola.